Evelyn Marie Harris Brown, daughter of Velma Gonder and Arthur Harris, died on May 12, 2014. 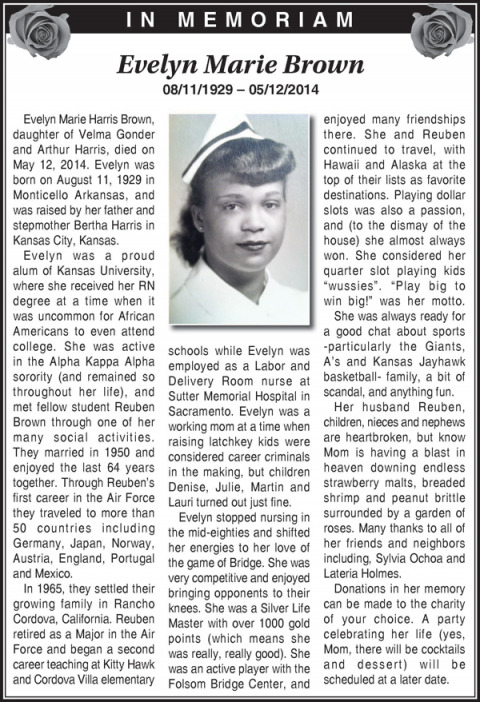 Evelyn was born on August 11, 1929 in Monticello Arkansas, and was raised by her father and stepmother Bertha Harris in Kansas City, Kansas. Evelyn was a proud alum of Kansas University, where she received her RN degree at a time when it was uncommon for African Americans to even attend college. She was active in the Alpha Kappa Alpha sorority (and remained so throughout her life), and met fellow student Reuben Brown through one of her many social activities. They married in 1950 and enjoyed the last 64 years together. Through Reuben’s first career in the Air Force they traveled to more than 50 countries including Germany, Japan, Norway, Austria, England, Portugal and Mexico. In 1965, they settled their growing family in Rancho Cordova, California. Reuben retired as a Major in the Air Force and began a second career teaching at Kitty Hawk and Cordova Villa elementary schools while Evelyn was employed as a Labor and Delivery Room nurse at Sutter Memorial Hospital in Sacramento. Evelyn was a working mom at a time when raising latchkey kids were considered career criminals in the making, but children Denise, Julie, Martin and Lauri turned out just fine. Evelyn stopped nursing in the mid-eighties and shifted her energies to her love of the game of Bridge. She was very competitive and enjoyed bringing opponents to their knees. She was a Silver Life Master with over 1000 gold points (which means she was really, really good). She was an active player with the Folsom Bridge Center, and enjoyed many friendships there. She and Reuben continued to travel, with Hawaii and Alaska at the top of their lists as favorite destinations. Playing dollar slots was also a passion, and (to the dismay of the house) she almost always won. She considered her quarter slot playing kids “wussies”. “Play big to win big!” was her motto. She was always ready for a good chat about sports -particularly the Giants, A’s and Kansas Jayhawk basketball- family, a bit of scandal, and anything fun. Her husband Reuben, children, nieces and nephews are heartbroken, but know Mom is having a blast in heaven downing endless strawberry malts, breaded shrimp and peanut brittle surrounded by a garden of roses. Many thanks to all of her friends and neighbors including, Sylvia Ochoa and Lateria Holmes. Donations in her memory can be made to the charity of your choice. A party celebrating her life (yes, Mom, there will be cocktails and dessert) will be scheduled at a later date.